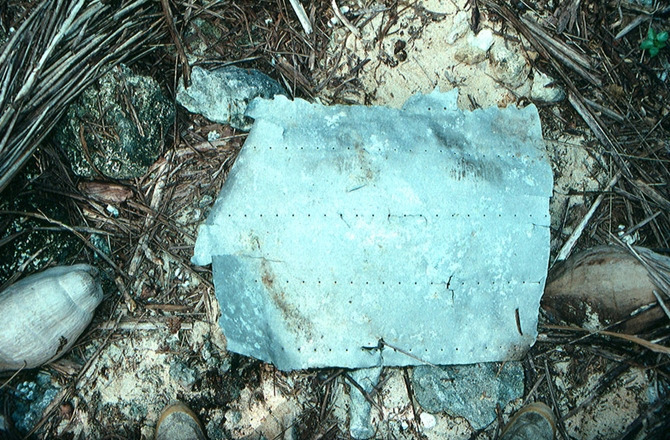 A piece of aluminum recovered from Nikumaroro, an uninhabited atoll in the southwestern Pacific Ocean, has been identified to a high degree of certainty as a patch that had been applied to Amelia Earhart’s Lockheed Electra on a stop during her attempt to circumnavigate the globe. The repair can been seen in a photograph published in the Miami Herald on June 1, 1937. The aluminum debris was discovered on the island in 1991 by researchers from The International Group for Historic Aircraft Recovery (TIGHAR). They compared the patch’s dimensions and features with the window of a Lockheed Electra being restored at Wichita Air Services in Newton, Kansas. “Its complex fingerprint of dimensions, proportions, materials and rivet patterns was as unique to Earhart’s Electra as a fingerprint is to an individual,” Rick Gillespie, executive director of TIGHAR, told Discovery News. He adds that the piece of the plane provides strong circumstantial evidence that Earhart and her navigator, Fred Noonan, landed on Nikumaroro’s coral reef and eventually died there as castaways. TIGHAR will continue to look for wreckage of the lost aircraft, thought to have washed into the ocean, next summer, beginning at a possible site 600 feet underwater.